Posted on January 22, 2017 January 31, 2017 by SherylPosted in FoodTagged beans, soup. Previous Previous post: Is the Bread Crust Less Digestible than the Inside? 100 years ago or now, this would appeal to me. I agree – Some foods are timeless. Did you happen to find this recipe in Good Housekeeping? I found it there when I went searching for information on Mrs. Porter. I live only a few miles from Texas City, and met some Porters from there once. I suspected they might all be related, and it seems they are. You just never know what you’re going to find on the internet. Not only is it a good recipe, it’s “down home” in every sense of the word — at least for me! 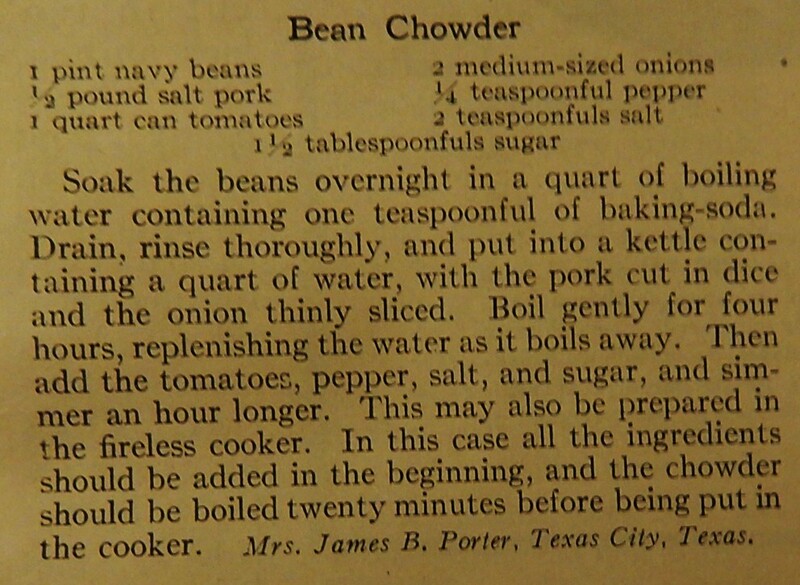 Yes, I found it in the April, 1916 issue of Good Housekeeping. Back then the magazine included lots of recipes submitted by readers. It’s amazing that you might have met some of the recipe author’s relatives. I love pinto bean soup! I use a pressure cooker when I cook dried beans, it only takes 25 minutes for pinto beans if they’ve been soaked overnight. Do you know when pressure cookers were invented? Thanks for the suggestion. I never thought about using a pressure cooker with dried beans. I’m not sure when pressure cookers were invented, but I know that they have been around for more than a hundred years. Last fall I did a post on canning equipment a hundred years ago that included a picture of a pressure cooker. One of my favorites, and thankfully my family likes it as well, I make this several times each winter. Was the recipe too salty? I used the amount of salt called for in the old recipe – and the soup was good, though perhaps a bit on the salty side. I’d recommend making this recipe without the added salt, and then adding salt to taste when it is done. Love bean chowder! I know that it is a great soup to make on a cold night. Here it is not cold.. but dealing with tornadoes. Unusual for this time of year. Whew, I just saw a story on the news about the tornadoes a little bit ago, but I never thought about that they might be in the area where you live. I hope that there is not too much damage. My thoughts are with you and others in your area. It looks perfect for this time of the year. It is. The chowder is a nice, hearty soup that’s perfect on winter days. Love pulses in any form. Yum, yum, yum! There are so many different types of wonderful pulses that can be used to create lovely (and healthy) dishes. What a great recipe! looks delicious! This looks delicious (I would have to find a substitute for salt pork, though)! hmm. . . Corned beef, pastrami, or dried beef might work as substitutes. I was always under the impression that chowders always had milk or cream in them. Interesting to learn it’s not necessarily the case. Perfect! Once I’d sorted out what navy beans are. ‘Haricot’ in the UK. Now some homework for me to find out why ‘navy’. This sure looks good, even though it’s really hot down here at the bottom of the Earth. I grew up eating beans every Saturday night in Maine but I’ve never had a chowder. It sounds delicious! My wife makes a soup just like this. It is very good on a cold winter’s day. I wonder what is a fireless cooker? Fireless cookers were heavily insulated boxes that food was put into to complete cooking. The food was brought to a boil on the stove, and then quickly put into the fireless cooker for several hours where it continued to slowly cook. 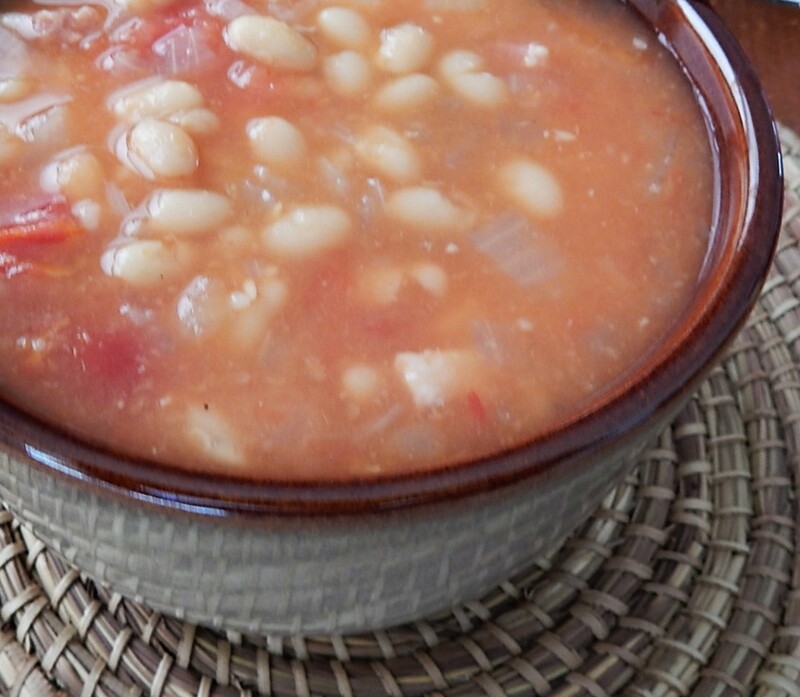 I am always cooking beans of some type and will have to try this version for bean chowder. Do you know what a fireless cooker is? Sounds like a crockpot! Fireless cookers were sort of like an early version of modern crockpots. Food was brought to a boil on the stove and then quickly moved to a heavily insulated box (i.e., the fireless cooker) for several hours to complete cooking. I have one thought about the prep time. If a recipe requires parts of two days, discard one day. It’s a mental crutch, but it works for me when making rolled out cookies. I like how you think about it. Thanks for the tip. Hi, I don’t know how I’ve missed your blog until now. I love old recipes and old cookbooks and I see a few mutual “blog friends” here! I’m off to explore more of your posts. Welcome! I enjoy all things related to food from days gone by. It’s wonderful to hear that you have similar interests. Sounds so good! Was salt different then? Larger grains, maybe? hmm. . . I don’t know. I think that sometime during the first half of the 20th century they started adding something to salt so that “when it rains it pours.” But, other than that, I have no idea if salt has changed. I was reading that larger grain salt, like kosher salt, is actually less “salty” than table salt, so it’s better for cooking. Maybe 100 years ago salt was more like kosher salt. Maybe it’s less “rainy” than Morton salt. Interesting . . . I learned something new. Thanks for sharing the info. you discovered. I’ll try this good, old hearty soup! This does look hearty and flavorful, too! It’s a very nice soup. This looks delicious. And now that I know navy beans are haricot beans, I might even give it a go. Beans and pork are a great combination, I think – there’s a pork, chorizo and butterbean stew (http://www.bbc.co.uk/food/recipes/porkchorizoandbutter_90830) that’s a regular in the yak household. Though I’m pretty sure chorizo wouldn’t have been on the menu in the UK 100 years ago. mmm. . . This looks delicious. I think of butter beans as a really old-fashioned bean – but when combined with the chorizo, you’re probably right that it won’t have been found it in the UK a hundred years ago.